Bahrain police abruptly broke up a peaceful demonstration in downtown Manama on Sunday, deploying tear gas and rubber bullets at close range. Despite warnings by US Secretary of Defense Robert M. Gates that half-measures are insufficient, the Sunni Bahrain monarchy has found itself unable to offer any substantial concessions to the Shiite citizen majority. Bahrain is an absolute monarchy where the king appoints the 40 members of the senate. The 40 members of the lower house are elected, but gerrymandering prevents the Shiite majority from attaining a majority of seats in it. Besides, the lower house of parliament is relatively toothless, and it can be overruled by the appointed upper house. Both can be over-ruled by the king. The monarchy allows the US Fifth Fleet to use a naval base at Manama for hist HQ, a key military asset for Washington that the Pentagon would be loathe to lose. Some legislators are calling upon the king to declare martial law. 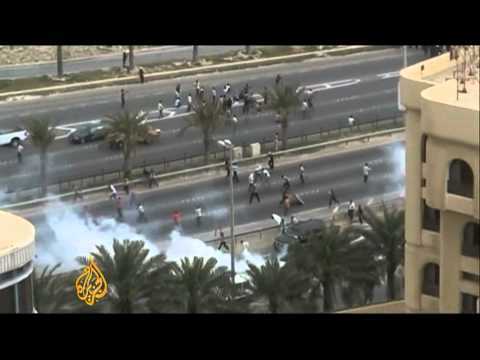 The Guardian goes further and reports that the Bahrain government may ask Saudi troops to come in to quell the protests. This step would be a game-changer in Bahrain, and it is hard to see how the Sunni monarchy could retain any legitimacy at all among its Shiite subjects if it took this desperate step.